It’s a slow week for Villanova basketball, nothing going on until this Sunday when La Salle comes to town. As the university prepares for the end of the semester and finals week, it would be an appropriate time to give some grades on the season so far. 9-0, Battle 4 Atlantis Champions, Top 10 on the AP Polls – so far so good. 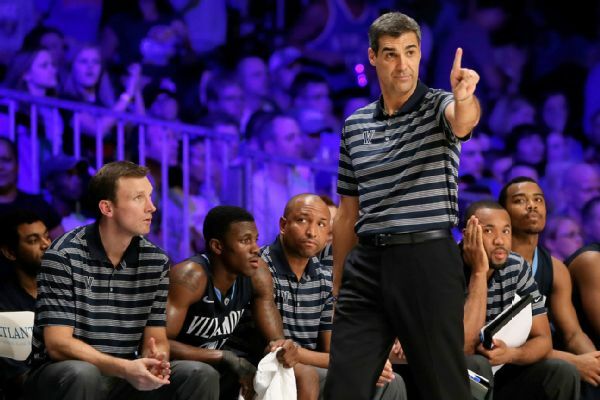 Jay Wright has gotten his squad to exceed expectations. He has a great handle on this team, which is averaging 83 points per game and holding opponents to an average of 65 points per game. Coach Wright has done a good job in managing this team and keeping his team always primed to play. They keep their foot on the gas pedal and continue to pour it on when they are winning. The Wildcats have also shown resilience and the “bend don’t break” mentality in games against Kansas, Iowa, and the first half against St. Joe’s in a hostile environment. A team that can fight back and not give up is reflective of the team’s coaching. Can’t complain about much so far in the season. If all goes well, Coach Wright should be able to lead the Wildcats to win these next two games and then travel over to Syracuse in what should a battle of undefeated teams and old rivals. The hero and the giant killer. Arcidiacono had his best game of the season against USC where he had 14 points (6-11 FG), 3 rebounds, and 6 assists. He was clutch against Kansas and down the stretch against Iowa. However, basketball is a game that goes beyond the final few minutes of the game. Archie has been going through a bit of a sophomore slump so far this year. His numbers and production has dropped from what it was last year. He is currently averaging 9.2 points per game, down from his 11.9 total average from last season. He’s shooting slightly better overall (34.6% versus 34.3%), but the long range game has suffered (25% versus 32.7%). On the bright side, he is taking better care of the ball, and hustles on the court; evident by his lunges for the loose ball. Arch is selecting better shots but he needs to convert on wide open looks. He has the most minutes out of anyone else on the team, he needs to step up his player efficiency. There’s plenty of games left and I believe that he is able to shake off the slump and excel. There’s not much you can complain about when it comes to the shooting guard out of Bethlehem, PA. He’s been performing well at this point in the season. He had a big time game against Penn, where he had 19 points, 4 rebounds, and an assist. It included a career high 4 three pointers in one game; all done in the first half alone. He has the second highest shooting percentage on the team, right behind JayVaughn Pinkston with 51.9%. He has improved from beyond the arc and is in the top 10 in the conference when it comes to three point shooting percentage, where he is shooting 41.9%. His game has improved from across the board; his scoring, rebounding, and assist numbers have all gone up from last season. He’s been enjoying a good season so far with 13.8 points per game, 4.7 rebounds per game, and 3.2 assists per game. (Last season: 11.4 points per game, 2.8 rebounds per game, and 1.6 assists per game) The few qualms with Hilliard this season are his free throw shooting and ball handling. He’s only shooting 56.4% from the line so far this season and he’s usually generally pretty solid from the line. He can turn the ball over quite a bit, evident in the Battle 4 Atlantis. However, since then he has only turned the ball over one time in each of the two games. It’s his last season on the Main Line and all you can ask for from a senior is that he plays with his heart and soul every minute he’s on the floor. Bell has been on fire so far, exploding to a great start to his senior campaign. He’s evolved into something much more than just someone who can knock down a few threes from the corner and has exceeded all expectations this season. So far he has been named the Battle 4 Atlantis MVP and has gotten Big East Player of the Week honors. More recently he has been named to ESPN college basketball analyst Sean Farnham’s #NoLoveTeam, five players who have been playing well but not getting the attention they deserve. Bell has put up double digit scoring in every game so far and is coming off of a double-double against Big 5 rival St. Joseph’s. He has more than doubled his scoring numbers from last season, currently averaging 17.6 points per game; a far cry from 8.6 points per game from last season. He leads the team in rebounds (7.3 per game) and is the best free throw shooter for the Wildcats (82.9%). I don’t see his play slowing down one bit as Villanova draws closer and closer to conference play. JVP is the leading scorer for the Wildcats and is an offensive beast in the paint. He averages 17.8 points per game, just a step ahead from fellow teammate James Bell. Like Bell, he also has had four 20+ point performances so far this season. Pinkston has performed very well so far, continuing the success he had last season. He is a great finisher around the rim and has the best field goal percentage on the team with 52.1%. When things aren’t going right on the perimeter on offense, the Wildcats will turn to him inside and he comes up big. Pinkston is the primary threat inside on offense, bullying his way inside and usually either finishing with a tough layup or drawing the foul. He leaves centers and opposing teams with little to no choice. Either he gets the basket or he gets sent to the free throw line where he can get the job done (76% free throw shooting). He also crashes the offensive glass effectively, about half of his rebounds come offensively. On defense, he has done a great job helping out inside. Not much you can ask for out of him besides for him to keep up the good work. From last year to this year, it seems that his play and production can only go nowhere but up. I’d like to start and say that people are a little too harsh on Chef. I’ve come to grips with the fact that he’s mainly a defensive player for now, and that’s okay. NBA players like Tyson Chandler and Joakim Noah make a living off of that. The rest of the Wildcats on the floor carry the offensive load just fine. I’m sure there’s an offensive game somewhere in him that needs to be tapped into and that will come over time. I remember last season watching the St. John’s game over winter break in my living room and being in awe of his put-back slam dunk. He is the third best blocker in the Big East and gets the crowd going with his defensive prowess. His 17 blocks over 153 on the season so far are achieved at a rate much faster than last season where he had 23 blocks over 594 minutes. He is also a solid rebounder, and uses his size and strength to his advantage on offense and defense. He falls short offensively. At times he is unable to convert open layups and dunks or turn the ball over on numerous occasions. He’s also been pretty quiet lately since fouling out against Kansas and only logging 8 minutes of action against Iowa until sitting the rest of the game. In the first four games (79 minutes) he racked up 16 points, 35 rebounds, 9 blocks, 10 turnovers. In the last five games (74 minutes) he has 17 points, 20 rebounds, 8 blocks, 11 turnovers. Granted, the numbers are about the same except for rebounding, the averages per game between these two different stretches are different. The amount of minutes he is on the floor are similar, but the production per game has dropped when comparing the first four games to the last five games. I believe he is capable of kicking his game up into high gear, and I disagree with those who say he shouldn’t be starting. Stay tuned for the rest of the lineup in part two, coming soon.